Shocking news surrounded us yesterday. Despite the on-going turbulence in country, I don’t think this cricket-loving nation could have imagined a well-planned, highly-armed attack on a guest team. Sri Lankan team decided to come and play in Pakistan, as a friendly gesture, when all other teams refused. Luckily, the sri lankans escaped life loss apart from few injuries. But five policemen and a bus driver could not succumb to the injuries and died. Reserve Umpire, Ahsan Raza, is still in critical condition. As usual, government is avoiding to take responsibility of this huge security lapse, at all costs. Rehman Malik’s press conference last night was an evidence. What I, and almost every concerned Pakistani, refuses to see is how come 12 attackers, armed with Kalashnikov, Grenades and Rocket Launchers, attack a bus for 15-20 minutes and no one comes to cover the scene? If media can reach the scene within minutes; why can’t rangers, commandos or even PAF’s fighter jets could have reached? In broad day-light attackers even achieved the cumbersome task to escape the scene unscathed; still no signs of security forces. Considering the liberty chowk’s plan, it was not a difficult task at all to encircle the attackers in that sphere. If for president or prime minister’s visit, the whole route can be pre-monitored for any unusual activity, wasn’t it the responsibility of the govt. to take such initiatives in this case too? Undoubtedly, the policemen did their job well. But at the cost of 6 precious lives. The ratio of 6:0 tell scores about security forces abilities and that of attackers. International cricket’s been murdered in Pakistan now, officially. Who’d like to come to this land of pure irresponsibility now? As Teeth Maestro wrote yesterday that I see stadiums turning into plots now …! May the nation stand united, Amen! The string’s getting tighter day-by-day. Blame game with more hopelessness continues. This is plainly frustrating. Dead or alive, I’ve always loved Islamabad for what it is. I love the greens of the city (which are not to green now). The clean roads, the Clouds Mountains, people who would go by if your tire is busted (unless you’re from the fair gender). So like little things you know, how we like to drive real fast near a pool of water with people passing by, how everyone think he’s royalty in front of every other person, how much we love to tell the cop who our father/uncle is, it’s all the little sweet things that make Islamabad Islamabad. Like the other day my mom was coming back from dropping my sister to school (yes I don’t wake up and drop and I’m a lousy son) on her way back (near 9th avenue, H-8 parallel road). There was a kid around 8 years old with a donkey cart when the donkey slipped and fell and the stuff on the cart fell over it, keeping the poor thing down. If that wasn’t enough the ‘nakel’ was strangling the little fellow. The kid was screaming and asking out for everyone to help him and crying on the top of his voice. The things were too heavy for him to lift them alone, while the poor creature struggled to breath. Mom dropped to help the child but just couldn’t while everyone just passed by late for work I presume. So ya, I just love Islamabad for its fancy schools and its fancy education, let’s bring justice walks and save the world parades. So welcome all, to Islamabad the Educated! President Asif Ali Zardari shakes hands with US Assistant Secretary of State Richard Boucher after conferring the Hilal-e-Quaid-i-Azam award on him during an ceremony at the Aiwan-e-Sadr on Monday. A statement issued by the Presidency said that Boucher had been instrumental in promoting a stable, broad-based and long-term Pak-US relationship. THIS makes me completely crazy. Americans are now awarded with hilals and deceased looters are printed on coins. So Quaid’s on a Re. 1 coin and Ms. Bhutto will get a Re.10 one. Yup that’s the news. Pakistan is to issue a commemorative coin to mark the first anniversary of the assassination of former Prime Minister Benazir Bhutto. The State Bank of Pakistan will issue about 300,000 special 10-rupee (16 US cents) coins. The coin will read in Urdu, “Daughter of the East, Benazir Bhutto“. Ms Bhutto was killed in a suicide bomb and gun attack in Rawalpindi on 27 December last year after an election rally for her Pakistan People’s Party. The coin will be issued on 27 December, the bank announced. Ms Bhutto has already had Islamabad’s international airport named after her, along with a hospital in Rawalpindi and a key road. 9/20: Lets Get Safe Ourselves! Not 18 hours completed and what do we see here? The Prime Minister and President of Pakistan desserts the capital city, Islamabad, for safe waters. At times like this when elsewhere premier of countries cancel their trips and return home. Ours thought the catastrophe done is normal. So, why fuss over a thing that’s not going to stop? So lets visit USA and meet Mr. Bush! Well actually its all normal, isn’t it? When things happen daily … it comes in normal range, No? Be it Islamabad, Peshawar, Quetta, Bajaur, Anguur Ada or any place else. … after yet again few promises of we are with you sir in YOUR War Against Terrorism. Even if we’ll have to risk Pakistan (and that we’re doing) … we won’t stray away from our promises. Though promises are not hadith or quran. But a promise with Uncle Sam can’t be compromised on. We’ll sacrifice our kids, our men, our women. Let’s make the whole world a 9/11 … to fight thy war of terrorism. The president who claims, during his fumbled up speech, god-knows-what … must be happily flying in a plane right now. He couldn’t bother paying the site a visit or sympathizing with the poor – common Pakistanis suffering in hospitals. And for our dear Prime Minister … attending a iftaar party in Lahore was much much important. We are a proud nation! We bicker a lot and we blame each other. We can’t even think straight … act is a totally different story. Isn’t it high time, govt show some steel in their necks? Take some stern decisions and ACT. Fight the war … but protect your own territories. If I and You can tell who did this … why can’t the govt? FGS. Take your own people into confidence. Stop war on your own people. Start digging for facts please … and Seriously … act before its too late. Though I’m not too sure if its already late or not. But then these are my opinions … you are free to share your own. Your own theories … and some plan of action if you can suggest would be highly welcome. I DID whine here … but I know whining would yield nothing. Its time to act. ps: In case you haven’t watched the CCTV footage earlier released … clickety. Seemingly there was lot of time … but nothing could be done to save this huge terrorist attack. The panic one feels when something like this happens is unbridled. Our first thoughts are for the safety of those we love most. Cellphones are whipped out, locations are verified. They’re safe. The panic subsides somewhat. But for many, many of us, the panic never did subside last night. For many, life changed forever the moment that truck exploded. And although this is a waking nightmare for us all, we can’t even begin to imagine the horrific magnitude of this nightmare for those who lost their loved ones last night. They are from among us, people just like you and me, and could easily have been you or me. In grieving for them, we grieve for ourselves, because it is the same. That all this death and destruction happened in one of the liveliest and most radiant locations in the city, a place we associated with special family dinners and weddings and exhibitions and festivity and warmth, makes it even more unpalatable in our minds. The sheer scale of this tragedy is still sinking in. And so is the extent of our vulnerability. According to TV reports, a hug explosion at Marriott (F-5) Islamabad is heard and seen. Causing fatalities and injuries. A second blast in Marriott in an years time. Its a “High Security” area. Update 1: 10-15 killed and many injured. Gas pipeline exploded as well causing more damage. Gulshan e Jinnah (living flats for federal govt employees) is affected badly as well. Its just at the back of mariott (almost). Ironically, its a “High Security” area. The entire front section of the Marriott Hotel has been blown out and wreckage is everywhere. 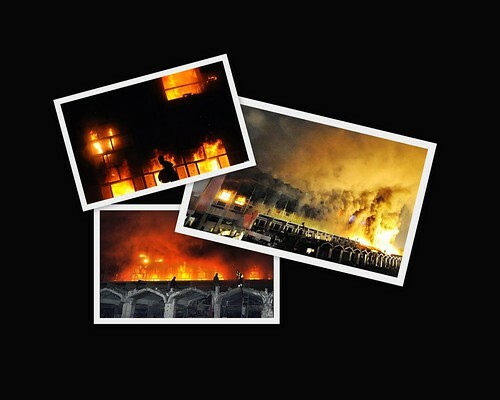 Reports are that it could be the biggest explosion – terrorist attack – in Pakistan’s history. Among dead, drivers out in parking area and the security guards mostly included (Geo and Aaj tv reports). For more videos and Pictures, also visit All Things Pakistan. 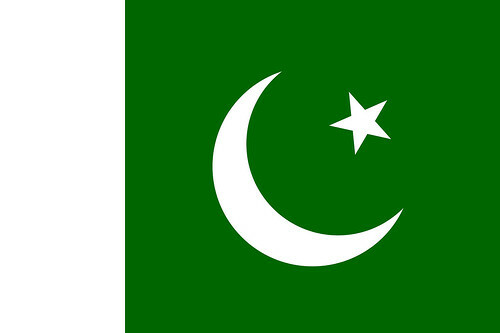 A (proper) Pakistani Flag!, originally uploaded by ~FurSid [XO8] – Busy & Away. While Flickring, I cane across this picture post and I knew it that I’ve to cross post it on Islamabad metblogs. Last year I even saw Pakistani flags with MICKEY MOUSE drawn instead of the crescent and star. It’s amazingly awful to see so many different versions of the Pakistani flag that it makes me sick! Sick to the core of my soul that why we do not respect the very flag!?? Various shades of green (even pink and blue! – for god’s sake!). Slogans and other text with/around the crescent and star. I think there should only be one version that we should be using wherever we use! * For ceremonial occasions. 21′ x 14′, 18′ x 12′, 10′ x 6-2/3′ or 9′ x 6 1/4. * For use over buildings. 6′ x 4′ or 3′ x 2′. * For cars 12″ x 8″. * For tables 10 1/4″ x 8 1/4″.